Like many schools, Gibson Elementary in St. Louis had big problems with attendance — many students were missing nearly a month of school a year. Melody Gunn, who was the principal at Gibson last year, set out to visit homes and figure out why kids weren't showing up. Her biggest discovery? They didn't have clean uniforms to wear to school. Many families, she found, didn't have washing machines in the home, and kids were embarrassed to show up at school wearing dirty clothes. The result was that often, they didn't come. Gunn thought this was a problem she could fix. She called Whirlpool, which agreed to donate some washers and dryers. Gunn had them installed at the school and then opened the doors for parents to use the machines. If folks couldn't make it during the school day, the school would offer access to the laundry machines after hours. It hasn't made every kid show up, but Principal Gunn says it's working. 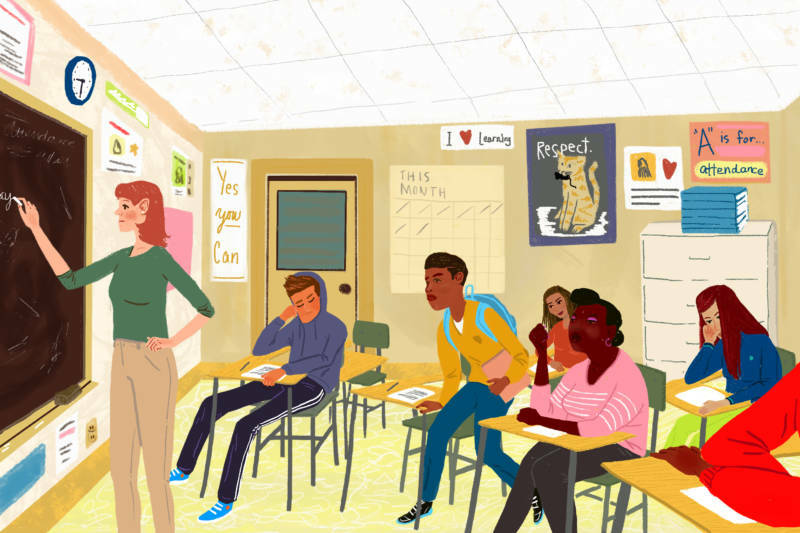 Chronic absence — defined as missing more than 10 percent of the school year (or just two days a month) — is one of the most destructive forces in a child's education. Yet more than 6 million students in the U.S. miss three weeks or more of school each year. Research shows that such students are way more likely to fall behind and, eventually, drop out. Addressing the problem goes way beyond skipping school — a mix of truancy entangled with illnesses and family problems. Getting kids to school is especially important at the beginning of the year. One study, from Baltimore, found that about half of students who missed two to four days in September went on to miss about a month of school for the whole year. The most important thing a school can do is figure out which students aren't at their desks. A few years ago, the Grand Rapids, Mich., school district undertook a big data project to identify kids who were chronically absent. The data mining showed a big problem: Of 17,000 kids in the district, nearly 7,000 were missing a month or more of school a year. District officials were super transparent about the numbers — they put 8-foot poster boards in every school, so folks could see if their numbers improved. This highly visible information on chronic absence helped schools and community organizations step in to start addressing why kids were missing. Experts say an important component of any attendance program is talking to the adults at home. Parents understand that attendance is important, but when you get down to specifics — like how many days kids can or should miss — there are a lot of misconceptions. New research from the Ad Council found that nearly half of parents thought it was OK to miss three or more days of school a month, but experts say missing that many days is harmful to student achievement. Another widely cited factor in improving attendance: Parents and students need to feel comfortable. I visited a school in Baltimore where the principal stands outside every morning — rain, shine, snow — and greets every kid and parent. They've seen attendance numbers shoot up. The interesting thing that happened in St. Louis, at Gibson Elementary, is that when the school opened up for parents to wash clothes, those adults became more engaged. Parents could wander around the school, meet staff and get comfortable with the building. "It was an unintended consequence. They saw we cared," Principal Gunn says. Experts point to mentors as one of the most successful strategies: Pairing kids who are chronically absent with an adult in the community — a college student, a firefighter, a teacher. So, washing machines may be a good idea at Gibson Elementary. But it may not work everywhere. Research suggests that, in order to improve attendance long-term, schools should use many strategies together. Strategies that will get everyone involved: parents, community partners, teachers and principals, and the students.